With so much detachment and insincere living, I feel like these types of videos and “putting myself out there” moments will become more and more the norm. Which means the pendulum will be swinging into radical realism. For more on . . .
"This is my dad as he appears in my mind - in the woods, ready to cut firewood, pipe in hand." A few years ago, a friend lost his father, somewhat unexpectedly. The father was elderly, his health had been in decline for awhile but he had been more or less fine one day and then the next, he was not. He was gone within three days, barely enough time for my friend's brothers to travel and say goodbye to their father. We attended the funeral and my friend spoke about his dad. He told stories and related memories of his father, and talked about how much his father influenced his own parenting. It was a very typical funeral, I imagine, but it stuck with me because it was a friend who had lost his parent and because my own father had had a major health issue very recently. In July of 2013, my dad nearly died from an aortic dissection. By all accounts, he is one of the luckiest people alive right now. The typical lifespan for someone who suffers what he did is twelve seconds. He was incredibly lucky in that the aneurysm did not fully rupture but started leaking into the layers of his aorta. It was painful and required a life flight and emergency surgery, but he lived. The doctors who performed the surgery told us initially the best case scenario they could foresee was paralysis from the waist down. Not only did my dad live, he walks and lives normally. About two years ago, he also had a bout of lung cancer. His tumor was discovered in the course of looking for other issues and so was caught long before he had any symptoms. He received a partial lung resection from a world class surgeon and did not have to undergo radiation or chemotherapy. While speaking with his surgeon, his aortic dissection came up and the surgeon was amazed at my dad's story. Weeks before, the surgeon had performed a double lung transplant but he said my dad's survival was miraculous. I have a lot of memories surrounding Dad’s triple A, from the white-knuckle, completely silent drive to Rapid City, to the sudden realization, after two days of staring at them, that there were posters on the walls of the ICU waiting room. Most of it has faded to the point that I no longer get panic attacks watching medical shows on tv. But what has stuck with me is how completely unprepared I was for the thought that my father might die. From the moment I finally heard the phone ringing at 3am, to the moment the phone rang in the waiting room to tell us Dad had made it through surgery, I did not believe he could actually die, even though the various doctors and surgeons tried to make it clear that his death was not only possible but probable. During the long night after his surgery, we took turns keeping vigil, monitoring the beeping from the twelve machines and thirty two different tubes keeping him alive. We all spoke of what we would need to do to accommodate possible disabilities, preparing ourselves for my dad not being able to care for himself. We did nothing to prepare ourselves for the possibility that he would die. In the immediacy of his medical emergency, there were things to be done, things to be researched, things to take care of. But none of us ever brought up the things that needed to be said. And in the years since, I don't think any of us have really taken the steps we need to deal with our emotions for and about each other. When Dad got his cancer diagnosis, he initially misunderstood his diagnosis and spent an entire day convinced he had mere weeks to live. He was preparing himself to do the paperwork necessary to take care of my mom and then off himself. In a strange way, it gave my sister, who has always had a somewhat fraught relationship with our father, an opening to talk about the things he needed to talk about and give her an insight into what kind of man he is. She spent several hours with him, listening to him and actually hearing him, for the first time perhaps. A lot of the things she had believed about our dad weren't necessarily wrong or false, but skewed and colored by her own life. Here's the thing about my dad: he doesn't talk about himself much. He has a big personality and lots of opinions but he loves to argue enough that you can never really know which opinion is his truest. He is also often overshadowed by the personalities of his wife and three daughters. The four of us are border collies, constantly in motion, herding everything and everyone towards a destination. My dad is a Great Pyrenees, blending in, looking like he's sleeping but aware of everything around him, ready to roar into action if something threatens his charges. A few months ago, my sister, who is a counselor, was messing around with the Meyers-Briggs personality evaluation. She asked me to take the evaluation- my type has been pretty consistent for over 20 years. Hers was predictable as well and for kicks, she asked our parents to take it. We were able to predict my mother's type pretty well but neither of us had the slightest idea of what my dad would be. He still hasn't taken it, or at least, hasn't told us that he's taken it. I think the fact that I can't predict if my father would be an introvert or extrovert probably indicates that he tends toward introverted, but it also says something that I don't know for sure. All of this comes together in my head in a morbid way- what would I say about my dad at his funeral? There are things I know about my dad, like how old he is, or that he tells everyone he is 5'10" when he is most definitely not. There are things I think about my dad, like that he is incredibly stubborn and I get my tendency towards clutter from him. There are also things I remember about my dad, like how he used to climb trees when we played hide-and-seek with him so he was impossible for us to find. Or how he told us his blue eyes would turn brown if we forgot to kiss him goodnight. And then there are things that were filtered through my mother, like how he could barely handle when each of us started dating. He never said a word to any of us about what he was thinking or feeling but according to my mother, he hated it and would have kept us penned up at home until we were 30. For Father's Day, my sister purchased tickets to take my father to a Beach Boys concert. She invited me to go with so it would be just the three of us. The only other memory I have of just the three of us was in our old green Córdoba, on the way to pick my mom and new baby sister up from the hospital. I was two, my older sister was five and my dad was 29. That was 37 years ago. The concert was fun and we had a great time. I had always known my dad liked The Beach Boys but listening to them and watching the videos they play as accompaniment to the music seemed to awaken memories and feelings Dad hadn't thought about in years. He told us about his first car, a 1936 Ford he'd picked up somewhere when he was twelve. It didn't have a title and he drove it around the farm where he worked. Now he wishes he hadn't been so rough on it and had kept it. At intermission and any breaks in the music, Dad talked about listening to The Beach Boys as a kid and in high school- he liked that they sang about cars, even if the hot rods they sang about weren't as popular in rural Wisconsin as they were on the West Coast. He told us stories of driving around with his brothers and friends, usually doing something legally dubious, but they were just kids having fun. I haven't yet found the words to articulate the emotions that night brought out in me. Part of it was watching The Beach Boys, live and the memorialized versions in the photos and videos playing on the large screen behind them as they sang. They are clearly old men now, with a career starting in 1961. It was somewhat heartbreaking to see the photos and videos from 57 years ago, peopled with the old men on stage and their friends who didn't make it to old age. The larger part of it was seeing and listening to my dad, and thinking about all of what he's been through in the past six or seven years, realizing that at one point, he was one of those vital young men who has now aged into an old man. On the drive home, Dad said that he could check seeing The Beach Boys off of his bucket list. Until he said that, I had no idea that seeing The Beach Boys with my father was on my bucket list but it turns out it was and I am grateful that I was able to check it off. As I grow older, and my dad older still, I realize there is so much I don’t know about him. I don’t know that we can learn to communicate at this stage of either of our lives, through the membranes of long history and our own reticent personalities and emotional repression, but I do know that I want to at least push the barriers a little. Because one day, I will stand at his funeral. I will shake hands with people who knew him, hug those who loved him and hear unfamiliar stories about him. I will also have a chance to share my stories about my dad and I want to have more than just enough to say. Because he deserves it. Because he’s my dad. And because his eyes never turned brown. If you have a story or link or something you'd like to share, let me know! BE SURE TO SCROLL DOWN AND SUBSCRIBE - THANKS FOR READING! Former Disney illustrator Gary Andrews started to "doodle diary" on his 54th birthday. He was happily married and a father-of-two and wanted to remember the joy and beauty of family. Within 3 years he was a widower. Joy, his wife, had passed away from sepsis. Struggling with ways to cope Gary "opened up his notebook and let his emotions pour out onto the pages" (via). I was crying so hard it was difficult to focus on the page. I was drawing through tears. Joy had been my soulmate for 19 years. She was beautiful, kind, generous and funny. We did everything together. When I lost her, I felt half of me had gone (via). Gary has published his work in hopes of raising "awareness for an illness that is often regarded as an afterthought for many doctors. Its symptoms, including fever, sickness, blotchy skin and dizziness, are often mistaken for other illnesses and not recognized until too late. If captured early on, it can be treated with simple antibiotics" (via). 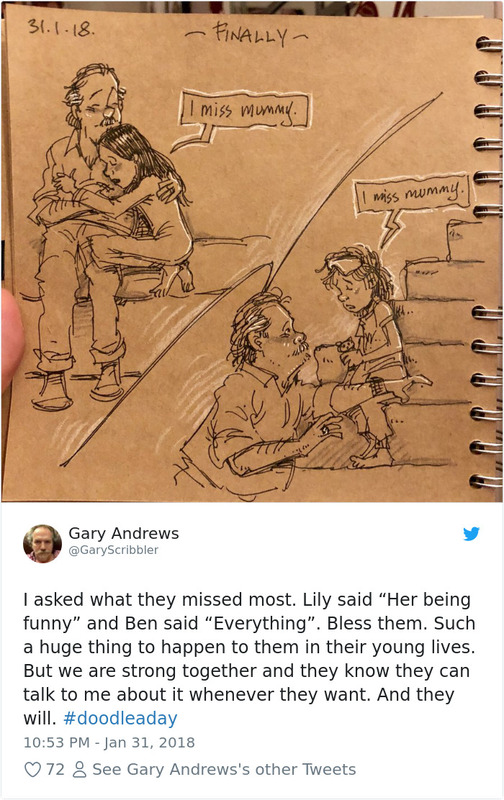 After spending a weekend celebrating my 35th birthday and considering the many (hopeful) boxes I have to fill in, this story and these drawings had me all sorts of choked up. May we treasure the time that we've been given. This one is my favorite because, as I've heard it said before, "Laughter is the manifestation of hope." I can imagine how often Gary felt heavy and depressed and just so alone - especially when his girls crawled into his lap and cried for Mom. But then, moments like these, and perhaps, seeing a bit of his wife's humor and hope shine through his little girls, his spirit was lifted. 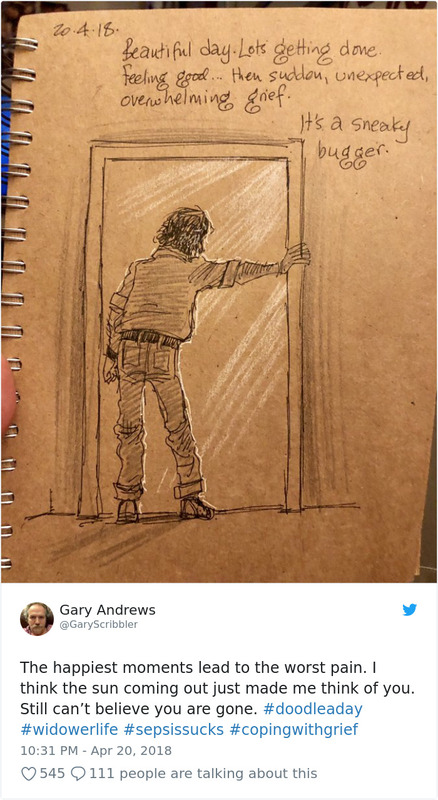 You can go here for more of Gary's story and to see a few extra sketches. Marriage. And Race Shouldn't Matter. This American Life posted an episode today, 20 Acts in 60 minutes, which told 20 different stories in 60 minutes. This was a huge deviation from their regular 3-4 stories in an episode and at first, I didn't like it. But then I got used to it, and by the third or forth story, I was laughing out loud with David Sedaris and crying with the teenage girls from a detention center who performed a song of apology for their parents. It was fantastic. Just like the short clips from the interracial couples. We don't see them long, but it doesn't matter. In their short moments, both together and separate, they all just humans. Which seems so obvious, but the fact that short clips are being made about them points to the reality that it isn't. There aren't any videos of white couples or two Indian couples talking about their marriages. Because that's just marriage. Not so with interracial marriages. Why do we have to put the tag on it, as interracial marriage. Shouldn't it just be marriage? Yes it should. Because it's just marriage. Between two people. And race shouldn't matter. When was the last time I was in Vietnam? It was last night. It was this morning. It was five minutes ago. And I will probably go back tonight. I first knew my dad, Tom Frame, was different when I was young, but I didn't know exactly how. Every year when he marched in our Memorial Day Parade in Doylestown, Pa., I stood on the side of the road waving my tiny American flag with so much pride. He was my dad, my veteran. As a teenager, I began to learn about his time in Vietnam during the late 1960s. I heard about fallen men, fierce battles and something called post-traumatic stress disorder. I still didn't fully grasp at that time what my father was living with, and it wasn't until my late 20s that I was ready to dive into a project about my dad's PTSD. The U.S. Department of Veterans Affairs estimates that 30 percent of all Vietnam veterans have suffered from PTSD, and the effects can last many years. When I began this project in 2014, I knew it would give me insight into my dad and his experiences in his early 20s, when he was fighting in Vietnam. I never anticipated the depth of understanding it would offer me into my mother and her life — standing by a veteran with deep-rooted trauma — and the role PTSD has played in their marriage. The documentary project follows the lives of my father and several other Vietnam veterans from his Army unit, the 1st Battalion, 5th (Mechanized) Infantry, 25th Infantry Division, who served together. The veterans recount a terrible ambush at a rubber plantation in Ben Cui on Aug. 21, 1968. And their wives open up on how PTSD has affected their marriages in the decades since (via). You know what I think PTSB is, at root? I think it's a spiritual wound, and I don't think it can be treated with medications necessarily. I think it requires some spiritual healing with people. Some meaning making again. Some reconnecting with your values and your morals and your ethics. Now that you've sort of seen the other side of life. I love that, "spiritual healing with people." Not alone, not in prayer, and not alone in prayer, but with people. Tania Georgelas, the ex-wife of the highest-ranking American member of ISIS, reckons with her extremist past and attempts to build a new life (via). And in many ways, it's ours too. The dual transformation of John and Tania is the most American part of this story. What is America, if not a promise of infinite possibility, and ability to transcend one’s origins? John grew up wealthy, Christian, and patriotic; now he is poor, Muslim, and full of hate for his native land. Tania’s metamorphosis has taken the precise opposite form, as if the universe demanded symmetry in their stories, and decreed that she resume the prosperous suburban life that he left behind. They met in the middle, trading fates. His ending is probably already written. Her life, if she’s lucky, is just getting started (via). What stuck me most about this story is the assurances of truth. 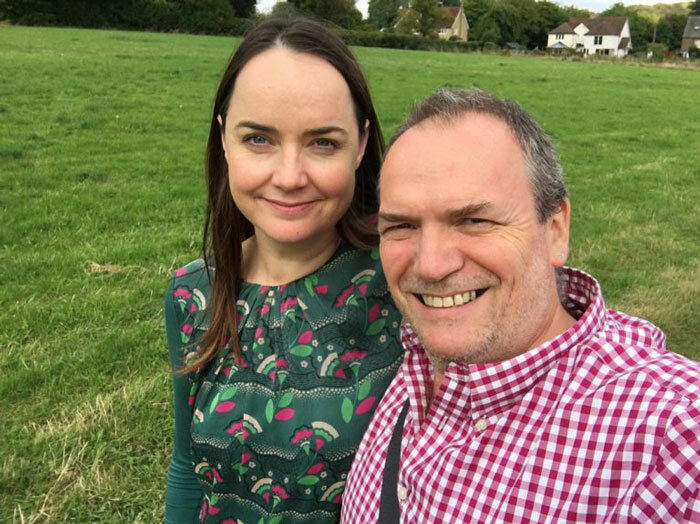 John and Tania, on either sides of their transitions, are so very confident in what they know and how they know it, allow it to guide and direct their lives, even to the point of radicalism. Which isn't all that different from so many of us. We may not be joining ISIS, but we are just as confident in our truths and way of life - we too have certainty in what will happen when we die, and it guides and directs our daily lives, even to the point of radicalism. What we know can change in an instant, shifting the ground beneath our feet and bring our fortresses of faith and understanding crumbling to the ground - SMASH!!! But the chance to rebuild. Because truly, no one really knows anything for certain. And it is that understanding, that weight of uncertainty that should encourage us all to talk less and listen a whole lot more. To be kind and patient and less judgmental, and to truly consider the holes in our damns because really, we don't know, even when we think we do. And for many of us, the damn is about to beak. To see things from a different perspective is one of the most difficult things we have to do. 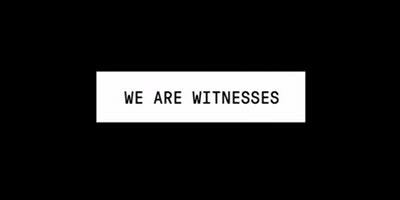 “We Are Witnesses,” is a project of nineteen short videos, each between two and six minutes long yet, together, provide rare 360-degree portrait of the state of crime and punishment in the United States (via). More importantly though, these short videos also portray the raw totality of humanity - the ugliness, the imperfection, the forgiveness, and the hope. Because life isn't perfect, filled happy endings and right now, in-the-moment decisions are terrifying and full of error. And at then end of the day, everyone just wants to make it home safe. If we allow ourselves to see life and circumstances and the people around us - especially those filled with stereotypes - with even the slightest bit of compassion and empathy and understanding, we can, day by day, all be saved. Even if it is the most difficult thing we have to do. It became more and more important for me to convey to him . . . uh . . . to convey this idea that we were each gonna get a second chance. And you should do something with that. That's when more things started changing with me. The compassion, the love, the understanding, being human again - trying to be human again. To love another human being that you really don't know or show compassion to someone you really don't know, that's all new to me. And that's what saved, saved me. Nine-five percent or more of the cops who work out there are just decent, hard working people, try'n a go out, try'n a do the best they can, and go home in one piece at the end of the night. I think people don't realize how difficult it is, night after night after night, having to make split second, life and death decisions, and always have'n to be right. I felt like, wow. In my saddest moment when I didn't know how to feel and I seen all these people out here for my dad . . . that just made me feel, empowered in a way. Because we can all be more than mere witnesses to the crime and punishiment in America today. We can also be the hope, if we want to be. If we choose to be. "Filmmaker Christian Schultz tells the story of Finn Muedder, a 3-year-old boy who suffers from from Hunter’s Syndrome, a rare disease affects about 500 boys in the U.S., an estimated 2,000 worldwide. Researchers believe they are close to a cure, but not without expensive new research -- money Jon doesn't have -- he used what he knew to get the world out" (via). It's not just about our family, it's about all these other families, and doing everything we can so that Finn and these other boys have a better chance at life. He may be the first generation of boys who really has a cure. Or, he may be part of the story, of boys, who brings the cure after him. Finn and his family have established a GoFundMe page where people can contribute to curing Hunter’s Syndrome once and for all. They need to make hit their $2.5 million target by November. Otherwise, important experiments won’t happen. To escape Auschwitz, Klara Prowisor, now 92, left her father to die in the hands of strangers. Decades later, she got a message from. This short film, directed by MATAN ROCHLITZ, is her story. Who knows how future generations will perceive the Holocaust and the extent to which it will figure in history. Perhaps in due time it will be just another event in the troubled timeline of our species. It is far beyond the scope of this film to engage with the enormity of these questions. All I know is that we are the last generation who will be able to meet Holocaust survivors in person, and I consider that a tremendous responsibility (via).